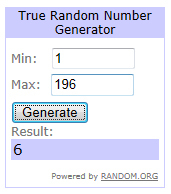 Well, I left this until the very last moment! I'm not sure if this is the norm all across America or if it's done anywhere else in the world either, but here locally in the elementary schools, kids bring in treat bags for their friends when it's their own birthday. 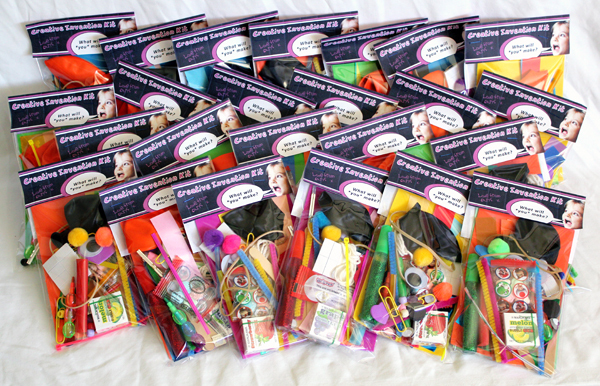 Carys is about to turn seven and she wanted to make each of her classmates an "invention kit". 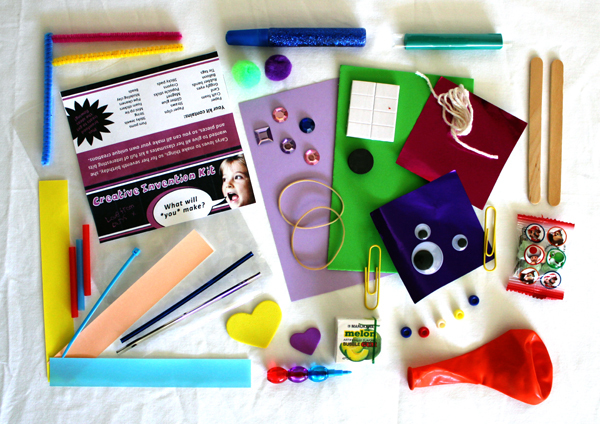 She's really into making things, totally random things, mind bogglingly weird things with all the bits and pieces of craft supplies and recycling that we have in our home, so it seemed like a natural sort of gift to come from her. My first thought was "How do I make this not look like a bag of bits and bobs of random rubbish?" I personally loved the idea of an invention kit vs the usual plastic party bag misc, but I didn't want her friends to think "Why are you giving me paperclips and string you weirdo? ", so I figured a bit of creative marketing might do the trick. The other reason I liked the idea was that we could put it together quite cheaply for a class of 24 kids. 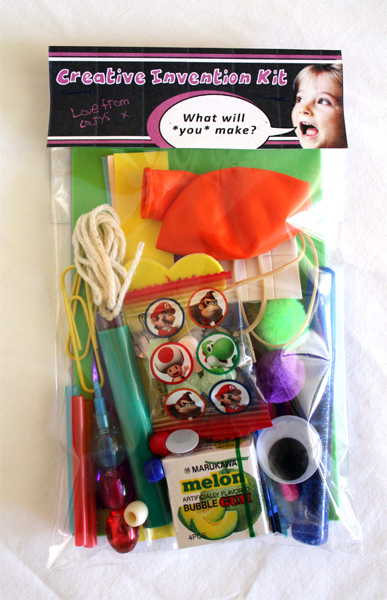 I had quite a lot of stuff around already that we could use in the kits, so it only took $4 spent in Daiso for the bags and candy, plus another $10 in the Dollar Tree for extra bits. Quite a lot fits in the little bag! I won't lie, it took a while to divide up all the bits into the 24 bags and make the paper topper for the kit, but it was done in a couple of hours, so not all that bad really. 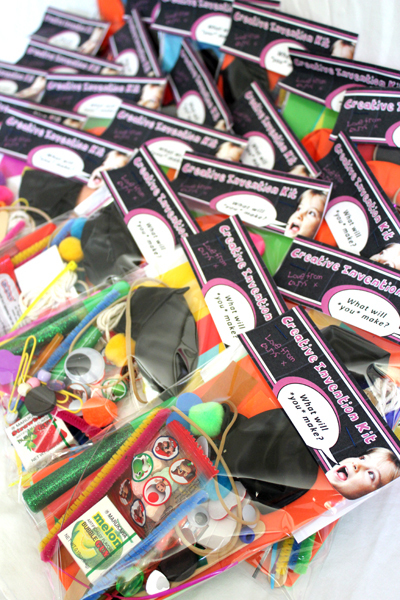 I put together the label for the top of the bag to personalise the gift and to make it look a bit like a proper craft kit so the kids are more enthused with the notion of an open ended, inventing project. They are just printed on regular printer paper, two to a sheet, folded over and then stapled onto the top of the bag. 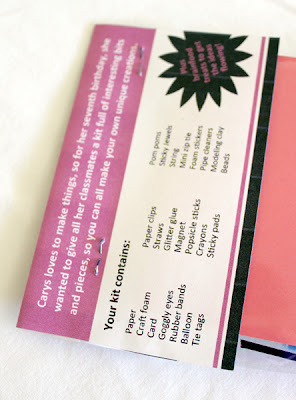 This is the back of the label that lists the contents. 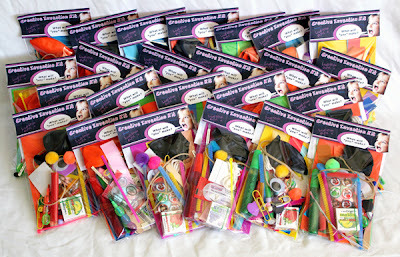 I actually had enough supplies to make 30 bags, which is great because we have some freinds coming over for Pizza and a movie on her actual birthday, which is Saturday, so they can have a kit each too. We've been planning and making her birthday present again this year. You might remember the Falcon dollhouse and Star Wars peg dolls from last year, well this year we've attempted something a bit bigger and significantly more ambitious, so with a three month old also in the picture, it'll be interesting to see if we can get it finished in time. By the way, the aforementioned three month old just keeps getting more and more delicious every day and looks so much like her biggest sister, the birthday girl did at that age! 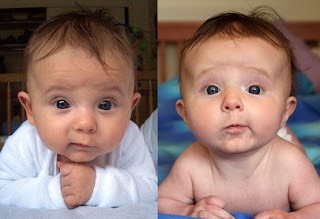 The photo on the left was taken almost seven years ago! Seven! Brain cannot compute! Yarrrr! Talk like a pirate day be just around the corner Mateys! September 19th to be exact. 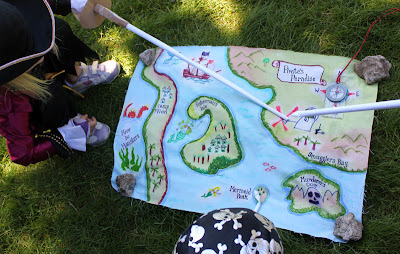 We've been making our own pirate treasure hunting maps over at Alpha Mom this year. It's a very simple project, using things you likely have around the house anyway. 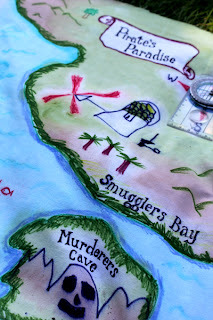 These maps will stand the test of time too, because they are cloth and so can't be ripped easily and can also be laundered, providing a keepsake of your child's artwork as well as a nifty play thing. 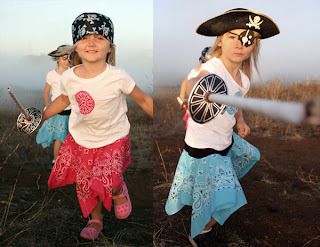 So me hearties, click over to Alpha Mom to see my post there on how we made these. 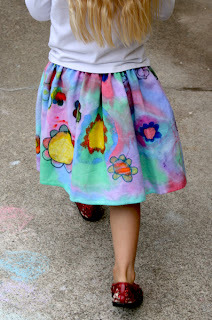 The technique used to make these maps is one that we've used in the past to make skirts for the kids out of their own artwork, but as you can see, it's such a flexible and easy way to get designs onto cloth, kids can use it to create pretty much anything their hearts desire. 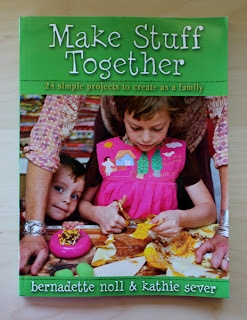 "Make Stuff Together" Giveaway winner. "What an interesting book! It sounds right up my alley." You can email me at filthwizardry at gmail dot com. 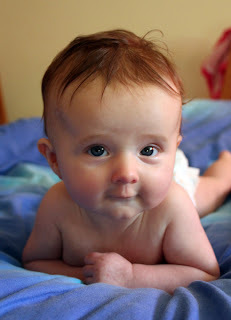 Thank you to all of you that commented. It's always nice to be able to see who some of my readers are, because I know a lot of you will have blogs of your own and it's nice to be able to click through and check them out. I've got more time to do that sort of thing now that I have to sit down to breastfeed several times a day :) Now I just need to get better at one handed typing, so that I can reply to my emails at a better pace!